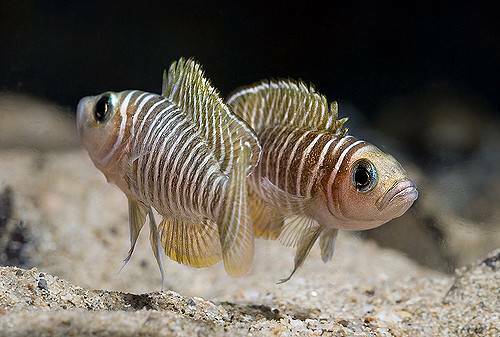 As the Fish of the Month for September, there will a bag of 8 x Neolamprologus similis around 2-4cm available at the PCS Meeting for auction. These are special lots to raise money for Stuart Grant Fund for Cichlid Preservation and have kindly been supplied by one of our PCS Member - Ashram. Neolamprologus similis is a tiny shell dweller from Lake Tanganyika. This fish for its size really packs a punch, and are fearless. Over the years, this neat little shellies has become more and more available. They are a pleasure to have in an aquarium, and show magnificent behavior. 'Lamprologus' similis has a larger eye than 'Lamprologus' multifasciatus. 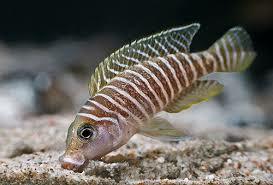 'Lamprologus' similis has one more stripe, located across the head. Neolamprologus similis is one of the less frequently seen shelldwellers in the hobby but has no less personality than its cousins. The territories it establishes are very small, usually measuring no more than 6″ across, but they are defended vigorously. The tiny fish will even bite hands or fingers that invade their ‘personal space’! It can be distinguished from the similar N. multifasciatus by the presence of additional barring on the head and neck and also in this species the stripes appear to be light in colour while in multifasciatus they appear dark. Male to 4.5cm. Female to 3.5cm. Endemic to Lake Tanganyika. It inhabits fairly deep water around the shoreline. These areas are characterised by soft substrates, where the empty shells of snails collect. 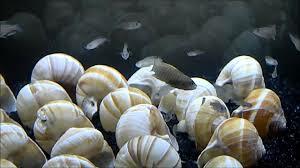 The aquarium should have large open areas of sandy substrate, to which should be added a good number of empty snail shells (see breeding section below). More shells should be provided than there are individual fish. The substrate should be at least 2″ deep as the species likes to dig. A territorial fish that will defend its shell and the small teritory around it vigorously. It can be combined with other species that inhabit other areas within the tank. Good tankmate choices include small rockdwellers such as Neolamprologus brichardi or smaller species of Julidochromis and open water species such as Cyprichromis. If a number of fish are kept, it will form a colony. If keeping it in this type of situation make sure there are enough shells to go around and try to buy more females than males. Quite easy. Shell brooder. It may breed in the community tank but if you want to raise a full brood of these, a separate tank should be used. Set it up as suggested above. Provide plenty of snail shells, as the females will lay their eggs in these. Escargot shells are a good choice and can be obtained from most decent delicatessens. Water should be hard and alkaline with a pH of around 8.0-8.5 and a temperature of 77-80°F. Keep several females per male and spacing the shells out a little. This helps to reduce aggression between males. Males may also spawn with multiple females if they are available. Condition the fish on a varied diet of live and frozen foods. Females will attempt to catch the attention of males by displaying at the entrance of their chosen shells, which they bury until only the entrance is visible. When a male is sufficiently interested, the female swims into the shell where she deposits her eggs. When she has finished, she begins to back out of the shell at which point the male releases his sperm. This is ‘sucked’ into the shell by the action of the exiting female, thus fertilising the eggs. Alternatively, if the shell is large enough the male may enter it before releasing his sperm. After fertilisation the male plays no further part in brood care and is no longer welcome in the female’s territory. The female sits on the shell, covering the entrance and fanning the eggs with her fins. These hatch in around 24 hours, becoming free swimming at around the 6-7 day stage. The fry now start to make forays away from the shell, venturing further and further as they grow. Eventually they are evicted by the female after another fortnight or so. The fry are big enough to accept brine shrimp nauplii or microworm once they become free swimming. It is probably better to remove them to a separate rearing tank at this stage to ensure the best survival rate. 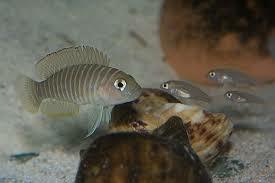 Although the parents do not usually harm them other fish in the colony may eat them. 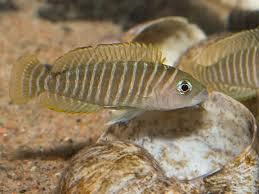 This is one of the smallest known cichlid species and exhibits truly fascinating behaviour. The territories it establishes are very small, usually measuring no more than 6″ across, but they are defended vigorously. The tiny fish will even bite hands or fingers that invade their ‘personal space’! Highly recommended to anyone wishing to observe some unique behaviour on a small scale.